By CandidCupcake on November 29th, 2012 . Filed under: Cupcake Ideas . 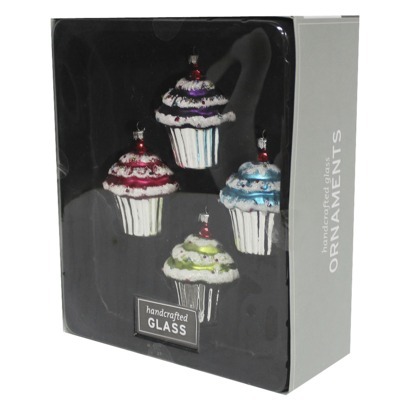 Are you wanting to go for a cupcake-themed Christmas tree this year, or just wanting to spruce up your current ornament collection with a few cupcakes? I was at Target on Black Friday and I stumbled upon these cute cupcake ornaments. For $10 you get a pack of 4. I think they look both cute and classy!